When it comes to creating nail art, there’s a lot of ways you can go about creating the look you want. You can either invest in a professional manicure – or you can get creative. Tape can help you get straight lines, a dotting tool (or even a bobbi pin or paper clip!) can create dots, and a really skinny brush and a steady hand will help with creating free-form designs. Today’s manicure requires a bit of creativity and a straw – yes, a plastic drinking straw. Read on to see how I got this ombre graffiti nail art! To create the look, I used China Glaze’s Ombre Kit, which comes with four full-sized colors: Sweet Hook (lightest), Spontaneous, Grape Pop, and Crimson (darkest). You don’t need an actual ombre kit to complete the look – just find four different shades in the same color family. I started with Sweet Hook, the lightest shade. After applying my Nail Tek II base coat and two coats of Sweet Hook, I let my nails dry completely. Since the “graffiti” process involves pressing on your nails, you won’t want to mess up the look. To create the design, you’ll need a plastic straw. I cut the straw into three pieces – one for each color. You’ll need to dip the straw into the polish, shake off any excess, and dot it onto your nails to create. I started the design with the darkest color (Crimson) on the bottom. I dipped a straw piece into the polish and pressed it along the tip of my nail, which created a series of circles, overlapping in some parts. Continue the process with a different straw for each color, moving upwards on your nail each tip you switch to a different, lighter color. You’ll want the circles to overlap – it adds to the “graffiti” look. Let your nails dry as much as you can before finishing with your favorite top coat or you’ll smudge the design! 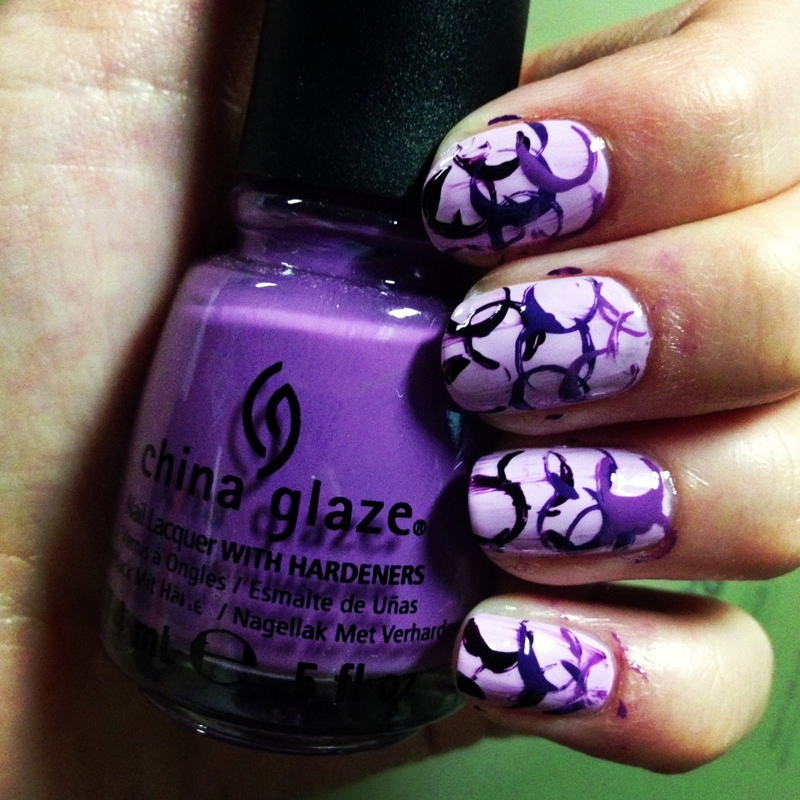 I’ve actually also tried this design with a white base coat and different colors within the design. It all depends on what look you’re going for! Would you try today’s Manicure Monday?